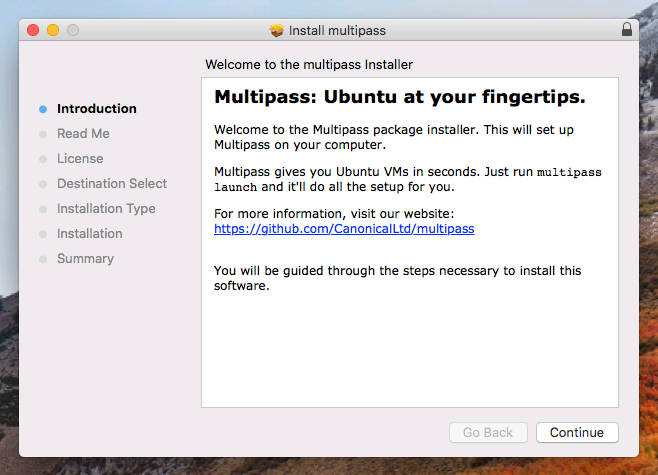 To install Multipass on macOS, download the latest installer from our GitHub releases page - it’s the .pkg package. You need macOS Yosemite, version 10.10.3 or later installed on a 2010 or newer Mac. If you want Tab completion on the command line, install bash-completion from brew first. Activate the downloaded installer and it will guide you through the steps necessary. You will need an account with Administrator privileges to complete the installation. Once installed, open the Terminal app and you can use multipass launch to create your first instance. Have a look at Working with instances to quickly get off the ground!